If you have read my blog before, you surely know how OBSESSED I am with skin care and anything having to do with beauty. My goal in life is to just glow from every pore! 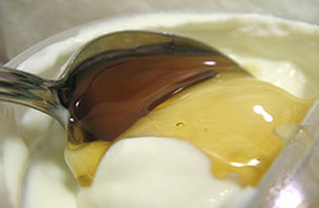 This easy and inexpensive recipe for a yogurt and honey mask will definitely make you glow! I’m not sure where I learned about it and it is not a new treatment, but it works. You will need: about a tablespoon of Plain Full Fat Greek Yogurt (I like the Trader Joe’s brand) and a squirt of Honey. Mix them together in a small bowl and apply to clean skin. Honey has incredible antibacterial properties and is often applied to infected wounds including unsightly blemishes. Greek Yogurt combats all kinds of skin issues from dry, dull skin to acne and oiliness. It covers EVERYTHING! You definitely want to use the full fat version as apposed to the low or non-fat options because the fat in the yogurt acts as a mild exfoliate and will give you that fresh, youthful radiance that we love! I try and do this mask about once a week before bedtime. What are some of your favorite natural beauty treatments?